To my bed with visions full of Slumberland’s enchanted shore. Quickly did I point my finger toward the bedroom’s open door. Upon my bed I’ll stretch out flat, my wearied senses to restore. That appears as if by clockwork in your dish upon the floor? So I would think you’d try to please the person who buys treats galore. By my lack of will inferring his was now the winning score. Both directly and by proxy, your commands they will ignore. Best admit that any chance of winning you long since foreswore. Photo: 'Halloween Dwyn' by Doug Watt. Make sure to check out more frightfully nice photos of Dwyn over at flickr. Yes, we posted this last year at this time, but you can never get too much of a good thing. Have a fun and safe Halloween! So long Dachtober. 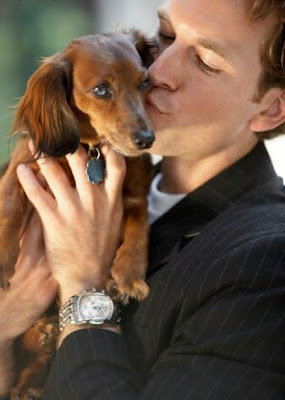 Q: What's the difference between a well dressed man and a Dachshund? A: The man wears a suit, the Dachshund just pants. We always get excited when there's news of a new dog park - get us out of the house, humans! Above, red smooth 'Dale' enjoys playing fetch with his human Ray Jensen at a new $400,000, 3.8 acre facility with a separate area for small dogs in West Jordan, Utah. Read all about it at The Salt Lake Tribune. Thanks so much to Melodie H. for sending this in. We're not so sure that we've ever seen anything so beautiful. If there's a dachshund lover on your holiday shopping list, or if you're looking for something to add to your own wish list, this is probably it. E.B. 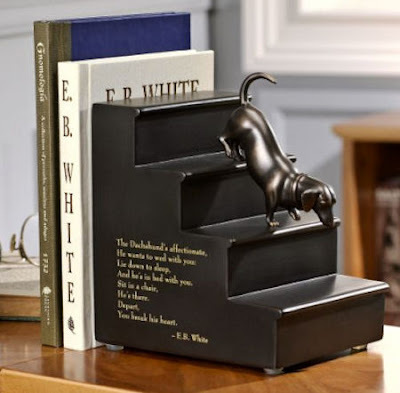 White's Dachshund Bookend: The bookend is sculpted from a drawing E. B. White made of his dachsie Minnie, for the family's 1950 Christmas card. Inscribed on it is White's poem to these petite pooches. One more treat: a freestanding mini booklet containing White's delightful essay on living the good life with his little creature: "[Minnie's] idea of life is a warm bed, preferably with an electric pad, and a friend in bed with her, and plenty of shut-eye, night and day." And he's in bed with you. Available at LEVENGER, tools for serious readers. Once upon a time, Nephew Rufus, began Uncle Peterfritz, back in the olden days when all dogs looked alike and there were no such things as Poodles, there lived two handsome young pups who were forever trying to outdo each other. If one of them chased a mouse, the other must pursue the cat; if this one jumped into a chair, that one must leap into a bed; and if the first got booted out, and whimpered, then the second must howl like a Baskerville when his turn came. So it went, until the Human People who lived with them shook their heads and wondered where the rivalry would end. Well, one summer day when it was so hot even the birds sat around with their tongues out and all the elder dogs stayed under the trees cooling their stomachs, these two pups lay side by side on the shaded verandah, apparently napping but in reality each casting about in his mind for something to accomplish - some act so daring and spectacular it would establish his supremacy over the other for once and for all. As he lay thinking, one of them, whom we will call Rufus for convenience sake - no, I don't know whether that was really his name - don't interrupt! As I was saying, this pup we'll call Rufus suddenly remembered that they were to have steak for dinner, and at the thought of it his tail began to wag of its own accord. "Now, why are you wagging your tail?" asked his rival, who had been watching him suspiciously from the edge of an eye. Rufus, not wanting to admit he wasn't absolute master of his own end, hurriedly put on a superior look and replied: "Because I do it so beautifully, of course! Need you ask?" "I must say, you certainly have an overblown opinion of yourself!" remarked the other, "Entirely unwarrantable, too. For it so happens that I am a more accomplished tail-wagger than you could ever hope to be. See?" He drummed a quick tattoo with his, to demonstrate. "You call that tail-wagging?" scoffed Rufus. "A Manx can do better! But get a load of this!" And he whipped his tail so rapidly and with such force that dust flew out of the porch rug. The other pup got to his feet, "Phui! must you beat carpets on a day like today? I thought we were discussing tail-wagging. Because if we are, and it's RPM's you want - observe!" And he flung his tail back and forth with such rapidity that it sounded like a hurricane in a clothesline. It was a wonder it didn't snap off. "You are creating quite a draft," sneered Rufus, also rising, "but I wasn't aware wind was the object. However, if it is tail-wagging you are attempting, permit me to show you what a wag really is!" So, bracing his hind legs and digging his toes, Rufus wagged - only "wag" doesn't describe the way that tail travelled! You couldn't even see it was a tail; so swiftly did it fly it looked like a chiffon blur. His rival didn't wait for him to finish. "Your reverse is absolutely sluggish!" he cried, above the zip and whish of Rufus' performance. "Can't you get it out of low? This is how is should be done - VAROOM!" "Rank ameteur!" panted Rufus, incredibly revving it up. "Dilettante!" puffed the other, beginning to vibrate all the way up to his ears. Remember I told you it was a hot day? Well you know what excessive heat does to things, like ice cubes and asphalt? It softens them. And because dogs weren't as tough in those olden days as they are now, heat affected them pretty much as it does a lump of taffy candy; and you can guess what happens to warm taffy when you begin swinging it about at a fast clip! Well, that's exactly what was happening to those two pups, only they were too furious to notice; the more they wagged, the more they elongated; and Dog knows what the outcome would have been if their mother hadn't come up to investigate the strange breeze whistling on the verandah. "Whelp! Whelp!" she shrieked when she saw what they were doing. "Stop this at once! Oh, you mad, mad, mad, mad dogs - just see what you've done! You've wagged yourselves into Dachshunds!" So that, Nephew Rufus, is how we happened to achieve our distinctive shape. And since the tail-wagging contest was broken up before a decision could be reached, each pup was convinced he'd won it, which is why every Dachshund, from that day to this, is certain he can beat any dog alive, only one must make sure the weather is just right before entering the competition. We don't know whether to be flattered or offended. Our stories and collections that we work hours and weeks on have been copied, translated, and reposted on a Russian dachshund blog with ads called Taksa Park, taksapark.blogspot.com: Такса Парк - Таксы. Блог о таксах, про такс и для такс! As an example, we worked about 6 months on this Dachshunds in Pop Culture: Jacques Cousteau story, buying magazines, collecting photos, scanning, perfecting.....waiting to post until it was just right.....to make a warm heart-felt story that hopefully our great readers enjoy. We're so depressed. We spend about three hours a day on The Long and Short of it All, trying to find and collect great content and stories, it's truly a labor of love. 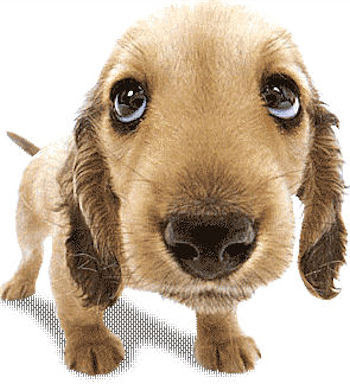 We'll be back tomorrow with more dachshund news and fun though, and we apologize for the somber tone of this post. Thanks as always for all your support and stopping by to read and comment when you get a chance. We wouldn't do it without our wonderful readers. Our favorite month of the year continues! Above, 'Buster' was one of many dachshunds that participated in the Weiner Dog races Saturday at the Dan Patch American Legion during Oktoberfest in Savage, Minnesota. Buster didn't win, but he sure looked good coming down the stretch. Buster is owned by Bradley Linnell, who was at the races representing "Dachshunds Making a Difference!" 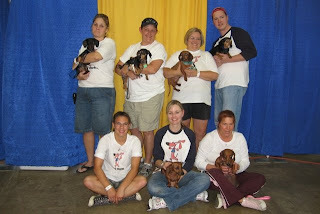 The $10 entry fee paid by participants who brought their dachshunds to the race were donated to the organization. Source. 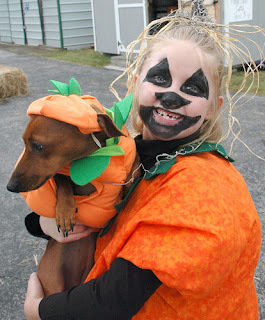 Pumpkin Patch: Six-year-old Danyell Lewis and her red smooth, 'Baby Lou Lou,' took third place in the annual Howloween pet costume contest sponsored by the Greeneville-Greene County Humane Society in Greeneville, Tennessee. Source. Hot Dogs: Bellaire’s second Howl-o-ween dog costume contest, parade and expo attracted more than 30 generally well behaved pooches of all sizes and bloodlines in Bellaire, Texas. Small dog-fright category winners were these "wiener dogs" because, according to judge Ezra Charles, thinking about what is in hotdogs is truly scary. Source. Clowning Around: Kevin Randall holds the People’s Choice trophy out for his red smooth 'Maggie May,' held by his wife Michelle Randall at the second annual Howl-O-Weenie Doggie Costume Contest in Rome, Georgia. The contest drew 31 contestants and raised $600 for the Rome-Floyd County Humane Society. Source. Can we get a woof? The bees that pollinate our fruits and vegetables, the cotton for our clothes, and the plants for the habitats of animals all over the world are vital to our existence. 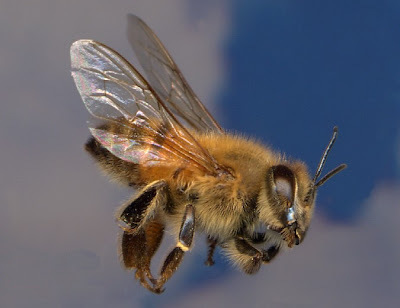 The current alarming decline in the population of bees could collapse our world as we know it. As Albert Einstein said "If the bee disappeared off the surface of the globe then man would only have four years of life left. No more bees, no more pollination, no more plants, no more animals, no more man." Source. But bees aren't always a dachshund and dog's best friend. 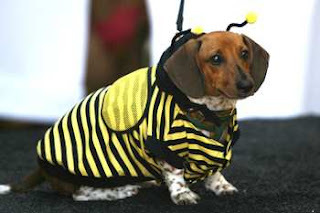 Yesterday we reported the unfortunate tale of 2 dachshunds and another dog that were killed in a bee attack in Florida. No sooner had the ink dried on that story when another story surfaced out of Meyerton, South Africa, where a dachshund and a pet monkey were killed in an attack, and a man is left in critical condition. What can dog lovers do to protect their furry friends from bees and wasps? Check out the nice instructions, tips, and warnings over at eHow.com. Also, check out a general article on insect stings over at Dachshund.org. They say bad things happen in 3's, and we don't want to hear another unfortunate tale of bees and dachshunds! Let's live in harmony with our buzzing and sometimes stinging flying friends. Proving once again that no other dog is as delicious as a dachshund, here's a dachshund news roundup on a much colder fall day, Monday, October 27th, 2008. 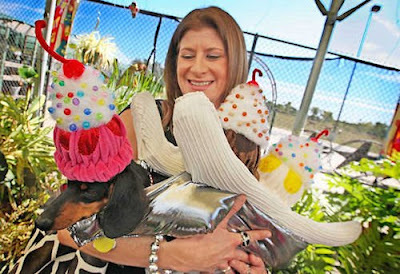 Above, smooth black and tan 'Lily' wasn't too happy being dressed up as a banana split, but her owner Sharon Flowers was all smiles when she learned that they won first place in the Pet Halloween contest held at Northside Ranch, Pet and Garden Center in Victoria, Texas on Saturday. "My husband thinks I'm crazy," said Flowers, laughing. "It's just fun." Read more about Lily and the event at the Victoria Advocate. 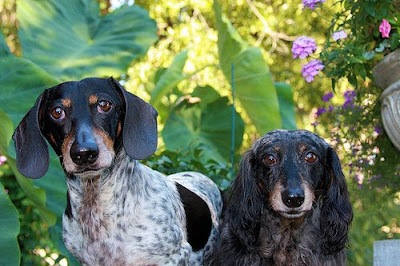 In the "news we don't like to hear about" department, two dachshunds and one other dog were attacked by bees and killed in Palm Beach County, Florida. 70-year-old Nancy Hill was walking her two dachshunds when the bees swarmed all three of them. Hill was treated at a hospital where doctors removed the multiple stingers, but the dogs died. The bees also attacked two other dogs in the neighborhood. One of those died and the other was injured. Our hearts go out to Mrs. Hill and all the families affected. Read more at North Florida News Daily. In the "news we DO like to hear about" department, the YWCA Women's Support Shelter in Tacoma, Washington, is not only a refuge for women facing domestic violence, but also their pets. Above, this woman shares her room with 2 cats and this handsome red smooth. This YWCA is one of five domestic violence shelters in the country recognized by the American Humane organization for its pet-friendly policy. The YWCA reports that many victims of domestic abuse say that they are worried about leaving their pets behind if they leave home. Read more at The News Tribune. Hundreds flocked to Veterans Park in College Station, Texas, on Saturday to Brazos Animal Shelter's 2nd annual Wiener Fest, which included a one mile "high tail it through the park," as well as a costume contest. You can watch a news video of the event at KBTX.com. And finally, speaking of bees, this red smooth piebald wouldn't hurt a flea! Susan Hull's dachshund, 'Wally,' is dressed as a bumblebee for a costume contest at The Barkery on Balboa Island, Newport Beach, California on Saturday. Read all about the event at The Daily Pilot. A Note From Joey and Maggie: Halloweenie Gala! 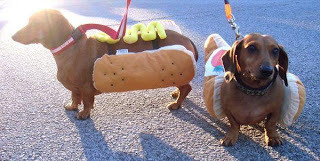 We hope all you dachshunds are enjoying 'Dachtober' as much as we are! 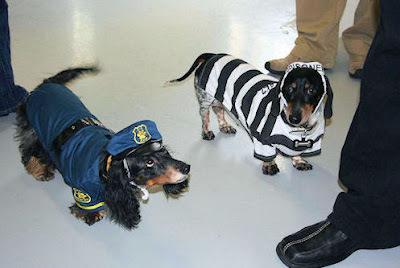 We attended Chicago Dachshund Lover's 4th Annual Halloweenie Gala yesterday, as Maggie the Canine Cop and Joey the Jaildog. We came in 2nd place in the 'funniest' category! Woof, Woof! 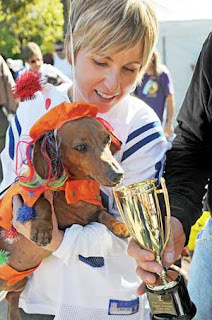 There were ribbons awarded for scariest, cutest, funniest, most original, and a 'People's Choice' category, where the attendees voted for the dachshund with the best costume. The People's Choice winner, as 'Plato,' seen below, won the special dachshund pumpkin! Let's get out there and win all those costume contests! The world must fear the fun fashion sense of dachshunds and dachshund lovers. 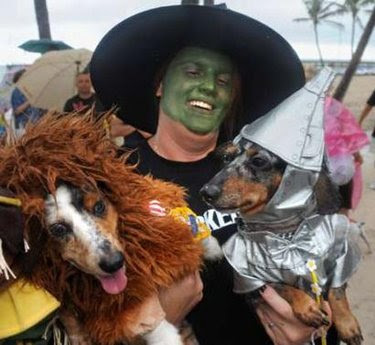 Above, Jodi Presley, costumed as the Wicked Witch of the West from the "Wizard of Oz," holds her dachshunds 'Snickers' as the Cowardly Lion (L), and 'Boomer' as the Tin Man (R), during the Fantasy Fest Pet Masquerade contest in Key West, Florida, October 22, 2008. The contingent along with Presley's niece, Isabella Perez portraying Dorothy, placed first in the kids' division. Way to go! The 10-day Fantasy Fest costuming and masking festival is set to continue through Sunday, October 26. Source. Q: What do you get when you cross a blonde with a brain? A: An English Crème Dachshund! 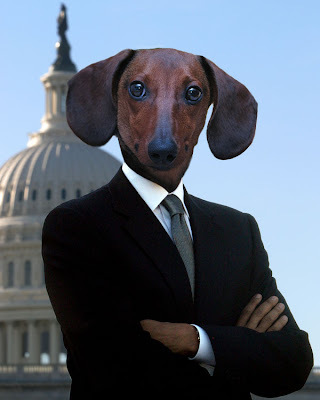 A photo of Joey the Dachshund as 'Joe-bama' by purephase. See even more pics and lots of fun stuff at Rosetta Stone for the painfully alone. Eleven more days of political ads and nonsense. It may as well be an eternity! Who? We think you know! 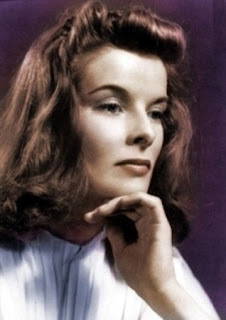 Katharine Houghton Hepburn (May 12, 1907 – June 29, 2003) was an American actress of film, television and stage. Acclaimed throughout her 73-year career, Hepburn holds the record for the most Best Actress Oscar wins with four, from 12 nominations. Her wins included her work in the films Morning Glory, Guess Who's Coming to Dinner, The Lion in Winter, and On Golden Pond. 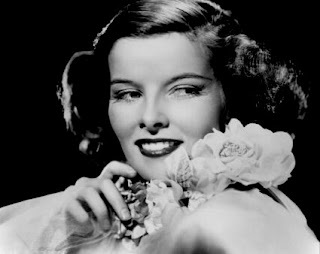 Hepburn won an Emmy Award in 1976 for her lead role in Love Among the Ruins, and was nominated for four other Emmys and two Tony Awards. In 1999, the American Film Institute ranked Hepburn as the greatest female star in the history of American cinema. 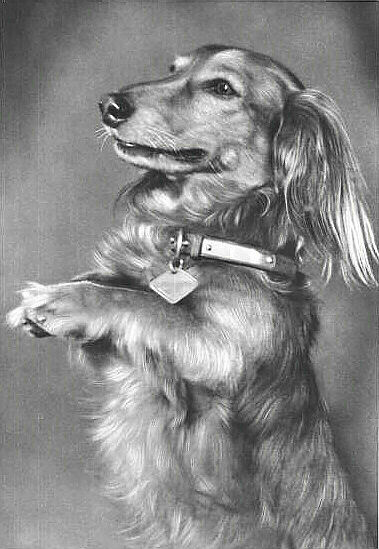 And oh yes, she was a dachshund lover. 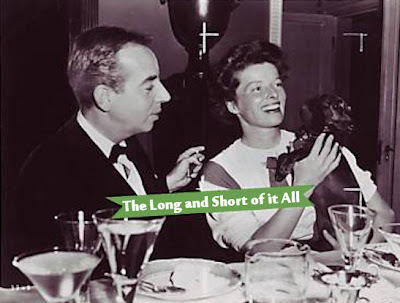 While we can't find any information to confirm this, she certainly looks comfortable with the pup, and we feel that only a dachshund lover would take her beloved dog to an awards dinner. If anyone has any more information, please send it in! 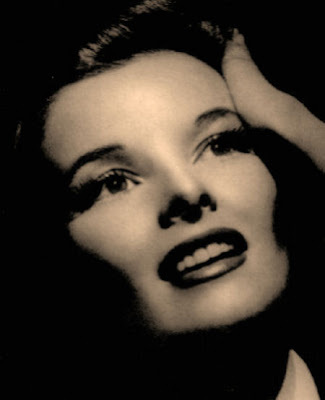 Find out more about Katharine Hepburn at the Katharine Hepburn Cultural Arts Center, who is helping us get to the bottom of that photo! Texas A&M veterinary student Jackie Curfman lets her red smooth, 'Flip,' stroll across the parking lot at Veterans Park in College Station, Texas, on Wednesday. Flip, who uses a cart to get around because of a back injury, will compete in the handicapped division at the second annual Wiener Fest in College Station this weekend. Go, Flip, Go! Read all about Flip and the races in a nice article at The Eagle. 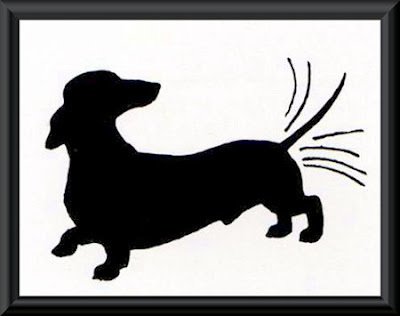 Learn about dachshunds and Intervertebral Disc Disease (IVDD) at Dodger's List. What a great resource. There's always a link to Dodger's List in the links column on your right. They have a very active discussion list, and are real pros when it comes to offering advice for IVDD dachshunds and general dachshund health. Learning to work cows is a part of a Dachshund's life on the Reiss farm at Kimball, Nebraska. So said Mrs. Alice Reiss in a letter largely about Nimpo. "Nimpo, a Wirehair, is the best cow dog we have had," said Mrs. Reiss. 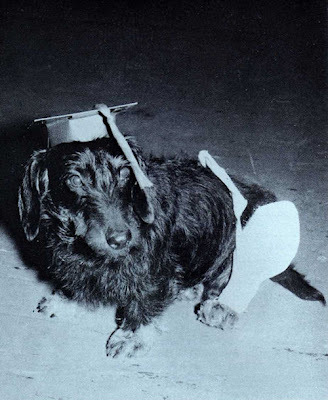 "We have raised dachshunds since 1949 and most of them learn to work cows before they are a year old." "Nimpo also is our first Obedience dog. But the day before he was to graduate from Obedience school, we were working some cows, and one of them got Nimpo against a snow bank. Nimpo couldn't get over or around, and the cow stepped on his leg and broke it." "But Nimpo went on to graduate anyway. He took third in the class despite the cast on his leg." "A week later we took the picture with the cows. It was sort of a standoff, neither the cows nor the dog willing to give ground. After the picture, we helped Nimpo, making the odds more even." "We usually take a dog along in the pickup when we bring in the cattle from pasture. When we get out where they are, we let the dog out and honk the horn, and the dog rounds up all the cows and starts them for home." 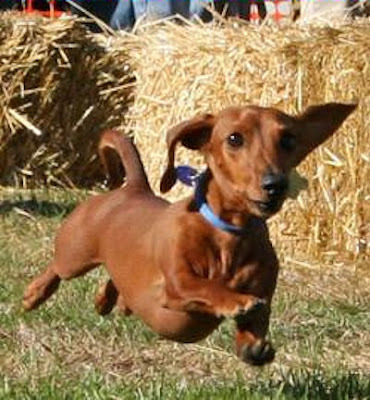 "The dachshunds go along when we use horses, too, and they keep up better than you might expect. But if we have the horses, the dogs are more apt to run onto a rabbit and take time out for a small hunt." "They are a big help moving cows from one corral to another or putting them in the chute for branding." 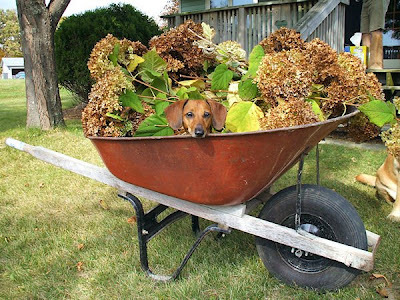 "It would be hard to get along without a Dachshund around to help. There are other breeds that make good cow dogs, but we have never found any with more courage, persistence, and intelligence than the Dachshund." "Nimpo is a grandson of Dachs Park Chocolate Soldier, a Ch Brentwald Joshua son." "A standoff, neither the cows nor Nimpo willing to give ground"
Meet black and tan longhair 'Tipper,' who hails from Land O' Lakes, Florida. Tipper is a therapy dog who also helps the kids read in her human's third-grade classroom at Oakstead Elementary School. Wow! All we do is sit around the house. Here's an excerpt about Tipper from The St. Petersburg Times: Tipper sure seemed to be paying close attention as 8-year-old Kayla Brackett read to her in rhyme. 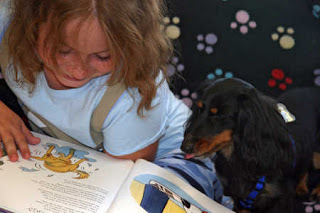 The book was aptly named Dog Poems, and the long-haired dachshund sat with Kayla in a comfortable corner in her master's third-grade classroom. And while it seemed Tipper loved the stories, it was really the Cheerios that won her over. Kayla kept the treats hidden in her tightly clenched fist underneath the book. Read all about Tipper and the reading program at The St. Petersburg Times. Woof, Woof! Meet 5-year-old red smooth 'Sassy' and her humans Crystal Williams and Brian McCutchen, who hail from Columbus, Ohio. 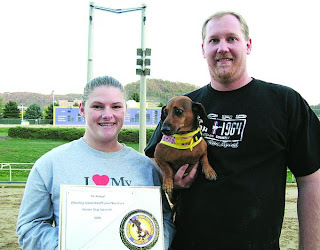 Sassy took home the $250 first place prize at the inaugural Wiener Dog Nationals on Sunday at Wheeling Island Hotel-Casino-Racetrack in Wheeling, West Virginia. Way to go Sassy! "We are very proud of her," Williams said. "If they have the race next year, we will be back. We had a blast." Read all about the race at the Times Leader, including some fun and interesting bios on the dogs who competed......Choo Choo: top speed is Mach 2.....CoCo Beara: likes to go four-wheeling, has own side car. Good stuff! Frankie Wins National Best Book Award! Frankie here, with some exciting news about my book! My book was chosen as the WINNER for the National Best Book Awards for 2008 named by USA BOOK News! I won in the category for Children's Picture Book Non-fiction softcover category. I'm thrilled to have been recognized with this honor. My mom and I are always happy when our message of hope and inspiration continues to spread out into the world. Bringing a positive face and voice to animals with disabilites means so much to us. As always, be positive and keep on rolling!! Wow! Big congrats to you and your mom, Frankie! We'll even throw out a congrats to your dad too, especially after he worked so hard on that costume for you at Milwaukee's Germanfest this year. Frankie is one of the hardest working dogs we know. As seen above, she even helps out in the garden! (We LOVE that pic!) 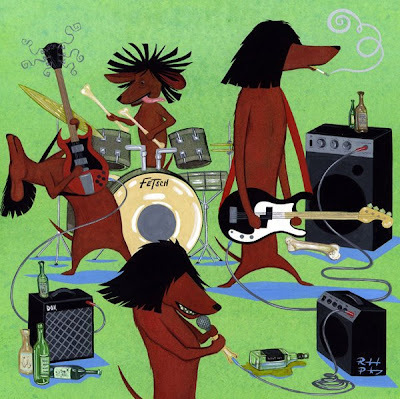 Frankie, the Walk 'n Roll Dog is a great inspirational read, with beautiful illustrations, and would make a nice gift for the youngsters on your holiday gift list this year. You can even WIN a copy over at the highly recommended Who's Your Dachshund? (Yesterday's hilarious post on WYD, Fritos (aka Corn Dogs) is one of the many reasons to never miss one of their daily posts). Keep up with Frankie on her blog. Proving yet again that your dachshund is your friend until the bitter end, here's a dachshund news roundup on a cool and cloudy, yet thankfully dry, Monday, Dachtober 20th, 2008. Woof! Above, 'Bosco,' a red smooth owned by Risa Castagno of the Brooklyn borough of New York, competes in the fourth annual Times Square Dog Day Masquerade canine costume contest Sunday Oct. 19, 2008 in New York's Times Square. The event was held to raise awareness for Animal Haven's Adopt-A-Pet program. (AP Photo) Source. 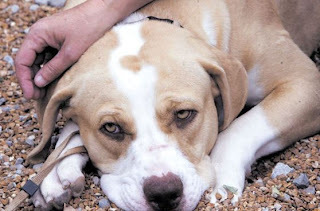 Tissue alert: Now, we try to stay focused on the dachshund around these parts, but this special boy named 'Truman,' an American bulldog/Staffordshire terrier mix, knows all about the friendship and love of the dachshund. See, he and his female dachshund friend were dumped at the side of the road, and the dachshund was hit and killed by a car. Truman also appeared to be hit by a car, but he sat by the body of his companion for 3 long days until animal control was able to pick him up. Excerpt from The Telegraph out of Alton, Illinois: "We tried to help him, but he ran from us," Jackie Spiker of Hope Animal Rescues said about the dog they named Truman because it means "loyal one." "Due to the dangerous location of the roadway, we had to abandon our attempts, so as not to chase him into the road," Spiker said. "We covered the little (dead) dog in a blue blanket and carried her farther into a field away from the road. 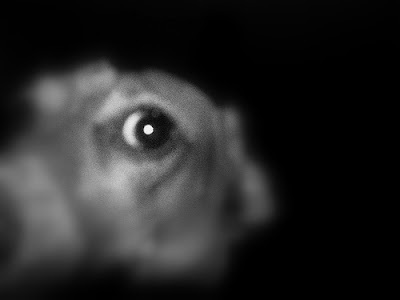 The bigger dog watched us the entire time but would not come near us." "He did not leave. He lay where she used to lay and remained there until Tuesday morning, when Animal Control tranquilized him, so that they could catch him safely." Read the entire account at The Telegraph. 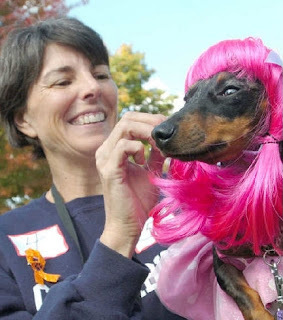 Meanwhile, over in Fort Wayne, Indiana, Ronda Hanning adjusts the pink wig on her 2-year-old black and tan smooth, 'Jacquie,' at the Pet Spook-Tacular sponsored by the Humane Organization for the Prevention of Euthanasia, or HOPE for Animals. Proceeds will help pay for a low-cost vaccine clinic the group will conduct, according to Madeleine Laird, a HOPE co-founder. Read all about the event at The Journal Gazette. 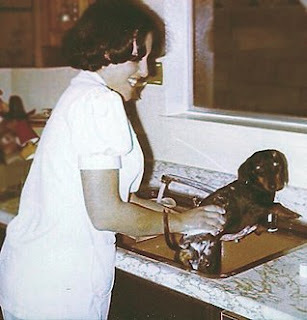 Another image has surfaced of the newest dachshund on the block, 'ZeFronk,' a French Dachshund who hosts a cooking show from his doghouse, Tasty Time with ZeFronk. 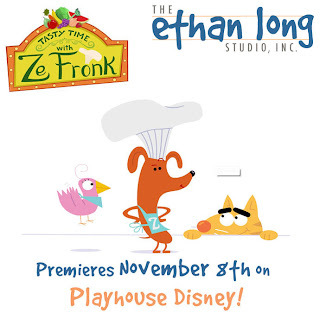 The animated series will premiere November 8th on Playhouse Disney, so gather up the kids, the grand kids, and the dachshunds so you don't miss it! Visit the artist's website: Ethan Long Studios. Finally, MARVEL at the BRIO dachshund pull toy, a classic since 1953. It would make a great gift for the youngsters on your holiday shopping list. From about $6 - $100 depending on the size and the store. Much like the real dachshund sitting on your lap, it never goes out of style. Good gosh, we've been waiting for weeks for a nice video or photos to surface from the recent Dachshund Friendship Club's fall parade in New York City. Youtuber Schlockumentaries delivered! Enjoy, it's fantastic! Meet Lucia, Cover Dachshund for Bergdorf Goodman; Her human is co-creator of The Dachs Song. Dan River Cottons: A fashion harvest of AUTUMN COTTONS. 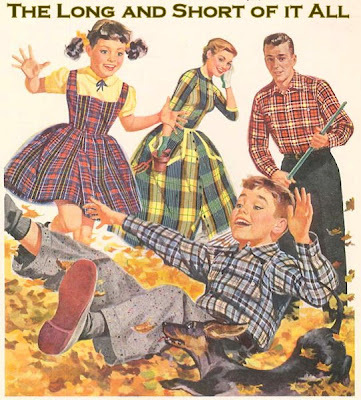 Nothing relaxes a family like Dan River's Autumn Cottons! They stay fresh all day through work or play....never need coddling. Thanks to Wrinkl-Shed, wrinkles hang-out; colors stay in for life. You'll find Dan River Autumn Cottons in handsome shirts for Dad and Brother....in stunning dresses and separates for Mother and Sister....and by the yard, too. Ask for them. You'll find a richness in color and pattern that's brand new in cotton....plus the wonders of Wrinkl-Shed! At all fine stores. Even tumbling in the leaves.....leaves Wrinkl-Shed unruffled! 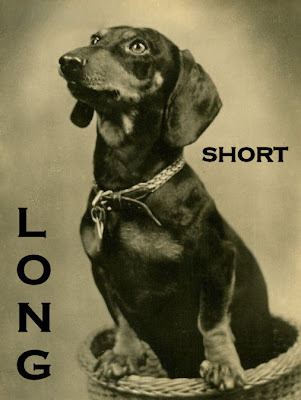 If you're a working dachshund, you probably already know about a new blog called Born to Track News & Views: news, reports, pictures, articles and announcements from born-to-track.com. Dachshunds bred and used for hunting and tracking wounded big game. Blood tracking, field trials, dog breeding, training and more. In the increasingly popular trend to use dachshunds for tracking of downed game, they offer up some interesting photos and nicely written stories and articles, like Can longhaired and smooth dachshunds be used for blood tracking? Sniff Sniff. Head on over to Born to Track News & Views. Above photo: Judge Sandy Horskin is watching 'Brooke' working the rabbit scent at some recent dachshund field trials in Batavia, NY. 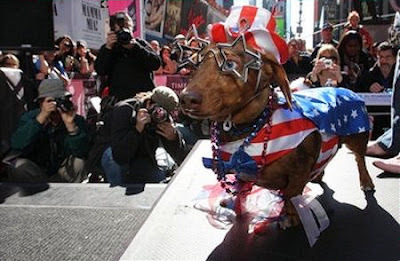 Us city dachshunds are just glad to say "Thank Dog it's Friday!" Have a great one. Meet Meryl Townes and her first dog, smooth black and tan 'Hans.' Ms. Townes recalls the fond memories she has of Hans in an article at The Las Vegas Sun. Here's an excerpt: They gave me the puppy and a small cardboard carton to transport him in. About 10 seconds into the trip home, the puppy began whining and jumping frantically to get out of the box. I couldn't drive the rest of the way home with all this commotion next to me, so I leaned over, picked him up and placed him on my lap. Big mistake! He curled into a ball and promptly went to sleep. I'm sure he chuckled inside knowing he won this round, the first of many he was to win over the next 15 years. We have another dachshund now and she is adorable, but there is no other dog that can ever replace Hans. Of all our dogs, he is the only one who left paw prints on my heart. 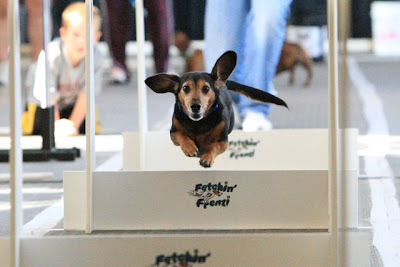 Thanks to our good pals, rescues 'Peaches' and 'Piper,' for sending in this great story of a special flyball Dream Team, comprised of dachshunds from all over the country who competed last weekend in Memphis, Tennessee! Wow! Wanna see some super speedy sausages? Don't miss the awesome video! We came in last place in our division, but we did manage to win 1 race against a team of Golden Retrievers! What we lacked in speed we made up for in cuteness and determination! Talk about fast and furry. Above vintage photo origin unknown, but probably 1940's or earlier based on the nice collar style. 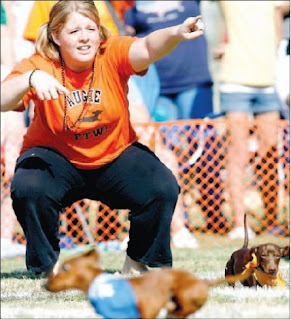 Congrats goes out to 'Speckles' of Rogers, Arkansas, for taking the prize at Bella Vista Animal Shelter's Second Annual Wiener Dog Races on Saturday in Bella Vista, Arkansas. About 400 people showed up to watch 84 dachshunds race. $9,000 was raised for the shelter! Way to go! Read all about it at NWAnews. Your Long and Short of it All hosts love to garden. We love to help Dad when he's outside weeding or planting or raking or watering. We can lay in the sun and relax, or bury our head deep in a fresh bag of organic soil and steal a big mouthful. Yum! There's nothing better than plucking the perfect tomato or cucumber or even rubbing against some fresh spices because they smell so good. But plants can be a danger to dogs, especially when they are brought in the house, or if dogs aren't supervised around them. We are a living testament to this, and this is our story. Last year Dad grew several containers of succulents in the garden. Similar to cacti in some regards, succulents or fat plants, are water-retaining plants adapted to arid climate or soil conditions. Succulent plants store water in their leaves, stems and/or roots. The storage of water often gives succulent plants a more swollen or fleshy appearance than other plants, also known as succulence. Common succulents are aloe and jade plants. They are unusual and exotic looking plants, and rightly quite beautiful. Dads succulents grew huge over the course of the season, some over 4 -feet-tall, and rather than let them die off when winter came, he brought all his best specimens in the house in the fall. Thanksgiving and the holidays came and went. On one cold January day, Joey was in some pain, and was refusing to eat. Joey had a history of back pain, and as a general rule of thumb with dachshunds, if your dog is in pain, look at the back first. So, it was off to the vet. Joey had x-rays and some degradation was seen in his spine. We started meds and 6 - 8 weeks of strict crate rest. He was also quite gassy, and even the vet commented that he was stinking up the room while she was doing his x-rays. With crate rest started, the next day he was outside doing his duty, and he stopped on the sidewalk for a big long stretch. This was strange though, because when he was in back pain a year earlier, he didn't do such a stretch for nearly 2 months. After he had an unusually huge bowel movement and talking with the vet, we decided that he had some GI distress of some sort, and that he was OK, and that he didn't have a back issue. Whew! Enter February. Suddenly Maggie pounces by, and she's foaming at the mouth. What? White foam all around her mouth, and drool hitting the floor. Off to the vets. "Did she get into anything?" the vet asked? "No, these dogs never get into anything. Ever. They're great dogs." Maggie received some anti-nauseants and some fluids, as she was slightly dehydrated. Then she seemed fine. Fast forward to Easter Day. Joey vomited. Not just a little pile of vomit, but a 2-foot-wide puddle of fluid on the hardwood floors. Then he did it again. Then again. Drinking a whole bowl full of water and whining by his empty water bowl, and even by the toilet and the shower, he was so thirsty. Then vomiting again. Off to the emergency vet. "Did he get into anything" the vet asked? "No, these dogs never get into anything. Ever. They're great dogs." Joey was so dehydrated that he had to spend the night at the emergency vets getting fluids, IV antibiotics, and anti-nauseants. He was able to come home 1.5 days later. At this point, our Dad is wondering what he is doing wrong. We've been basically perfectly healthy for 7 years, no GI issues ever. We've been fed raw meat and bones our whole lives, since we were 10 weeks old, are our bodies changing or something, maybe we can't handle raw food anymore? Is it allergies? But we seem to be just fine on our food now, and we've had it our whole lives. The vets didn't think that our food was the issue, but at one point, Dad still contacted our raw food company, and they examined the food we shipped back to them....it was fine. Fast forward to the Orthodox Easter Day. Joey is doing the same exact same thing he was doing on Easter. Doesn't Joey like Easter? What is his problem? Huge puddles of watery vomit, and there is no end in sight. He is a sick little pup. Off again to the emergency vets. Again, he is so dehydrated that he spends 2 days at the vets, and he was much sicker this time. A vet from Joey's previous visit talks to Dad and sternly says "This is the same problem he presented with before. You better figure out exactly what his problem is with your regular vet, he is very sick. We don't want to see him here again." Devastated and scared, and with no sleep for almost 24 hours, our Dad went home to take a nap. There, on the floor by the bed was one last pile of vomit he must have missed on clean-up duty, but this one was different. It was a pile of leaves. It was a pile of leaves from the succulents. What a fool our Dad has been all this time. He grabbed some clippings of the plants and took them to the vet. The vet couldn't determine if they were the exact cause of Joey and Maggie's issues, but more GI tests were ran that all came back fine. The houseplant was removed. It's now been about 6 months since Joey's last event. After $3,500 in vet bills, Joey and Maggie are happy and healthy, and looking forward to turning 8-years-old in December. We can assume at this point that the houseplant was the cause of their issues. 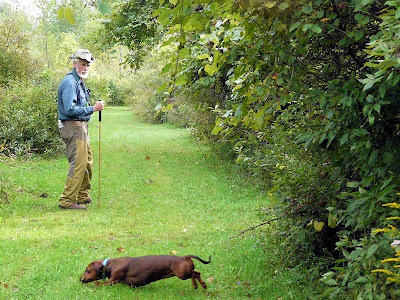 We're embarrassed to tell this tale, but hopefully other dachshund and dog owners can learn from our mistakes. Please watch your dogs around plants of any kind, indoors or out. Dogs are fragile creatures. Check the ASPCA's huge list of poisonous plants, and assume that most of your flower garden is poisonous. Keep house plants out of your dog's reach, and pick up any leaves that fall on the floor. If your dog is sick, think beyond what they may have gotten into, and think about the plants in your house and in your yard. We dearly wish the vets would have asked us what type of house plants we had at Joey's first vet visit in January. But most of all, love your dogs. 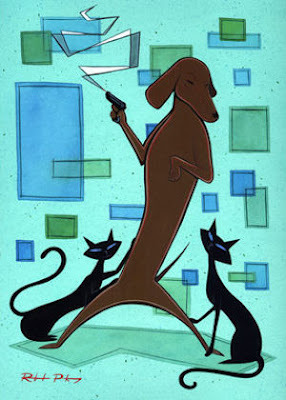 Dachshund Lover Robert Pokorny, who hails from Long Beach, California, offers up some great quirky and somewhat retro-ish artwork inspired by his red smooth 'Lily.' We honestly couldn't decide which of his pieces to post, each one is nicer than the next, and they sure do bring a smile to your face. They'd look great on your walls if you're looking for fun and funky dachshund art. Above is the hilarious piece titled Dog Daze. You can see more pieces and purchase prints at Thumbtack Press, keep up with the artist on his blog, or find out more at his website, RIP GALLERY. Woof!